First there was Brodie the Beardie pup who happens to be stone deaf but very happy with life! 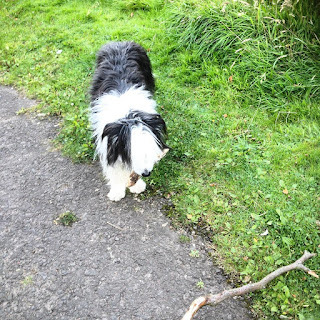 Then there was Maggie, also a Beardie who was fascinated with a piece of wood! Her, who must be obeyed, ain't very good at cycling up small inclines! Now looking over Loch Leven which we cycled round (at snail's pace) today. My new steed, a Giant Anthem 29er which henceforth will be known as Anthea, mainly because I couldn't think of anything better. There's not a better view up the Pentlands on a sunny Sunday morning! Kathy insisted on being photographed alongside another 2 old nags through the week! This morning at the start of the final climb to West Kip. And after a bit of sweat we reached West Kip! A climb I find very boring, the tarmac, dead straight climb up to Bavelaw. Another good week's biking with reasonable weather that got steadily better as the week went on ending in a hot fiery day today. The scenery in the Pentland Hills is probably at its peak just now with the heather in full bloom and the rides are interrupted for numerous photos.We'll better take the opportunity as the forecast for next week is the dreaded "unsettled", which usually means cold and rainy! The weekly average mileage is doing well at the moment but this could soon fall if the weather changes! Another good off road week of biking! Kathy, looking good as usual, but pushing up Castlelaw! Me looking as though I've sprung a leak! 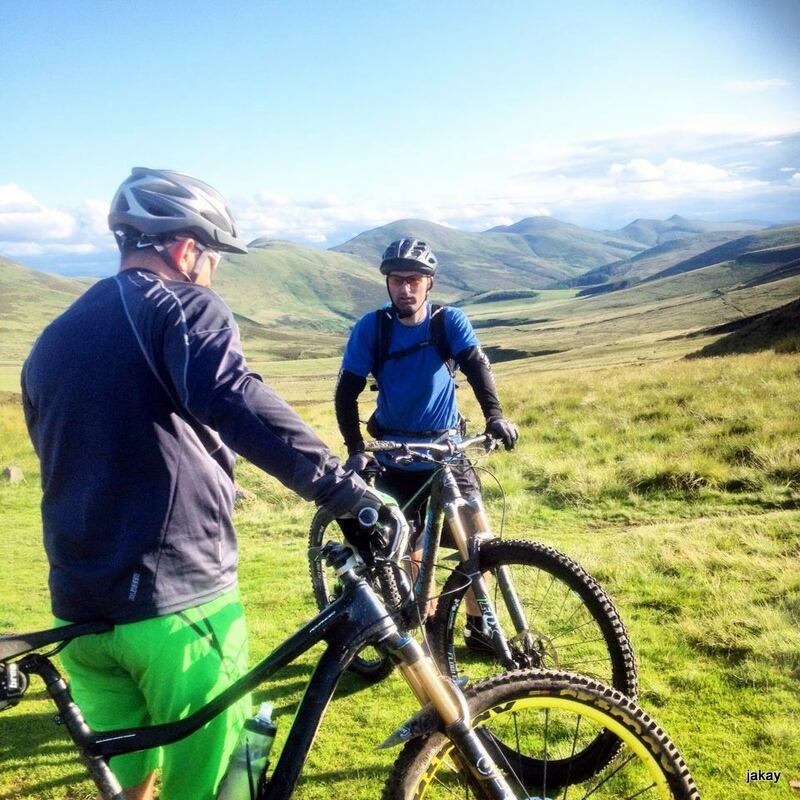 Another week of pretty good weather which has meant a lot of off road biking up the Pentlands, a lot of it done with Kathy and her son Matt. The difference in the last 2 weeks in them both is tremendous and I think with Matt in particular I'll have to fill his bike tyres with sand to slow him down a bit! Over 140 miles last week and over 150 miles this week, all off road, but will it continue and.....will the weather continue to hold? An additional highlight of the week was the fact that I passed 22000 miles on the Garmin since I bought it just over 4 years ago. What's happened........the weather's perked up! Five of us out this forenoon, with Kathy and Graeme primarily going for some open water swimming practice at Threipmuir and Kathy's son Matt out for his first ride in the Pentlands aboard one of my bikes. Matt gets pictured on the throne after riding up the seven steps for the first time to the top of Maidens Cleugh. Kathy and Graeme going up the valley from the Howe. The weather's improved, but don't get too carried away it'll probably not last very long! 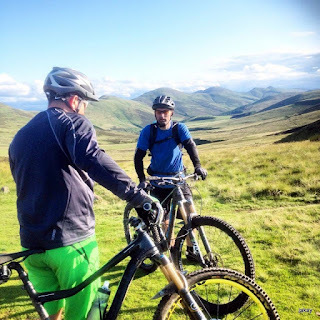 However we've taken advantage of this change to do a bit of Pentland biking today with Kathy, Graeme and Kathy's son Matt who's a top Scottish swimmer for his age but who was keen to try a bit of mountain biking. The most he'd done before was just over 5 miles in one go so today Clive and I extended that to 27.5 miles! The last news I had from Kathy was that he'd arrived home and fallen asleep! Hopefully he'll waken up in time for his next early morning swim training session!! There have been the odd good days.....unfortunately few and far between! A selfie type pose at the top of Maidens Cleugh, it came on rain just after that! It's been a rotten summer in Scotland, the blame being heaped on the jet stream which is almost permanently lodged over northern France instead of the north of Scotland. Never the less I've managed to somehow or other keep biking over 100 miles off road every week, surviving a hail storm up the Pentlands today with the Garmin showing the temperature at 6 Celsius, I managed to find a little cranny to shelter in while the worst of it passed over. I still got soaked though! Clive has just come back from holidaying in Grand Canaria where temperatures were consistently in the high 30s Celsius, he must really be feeling it!